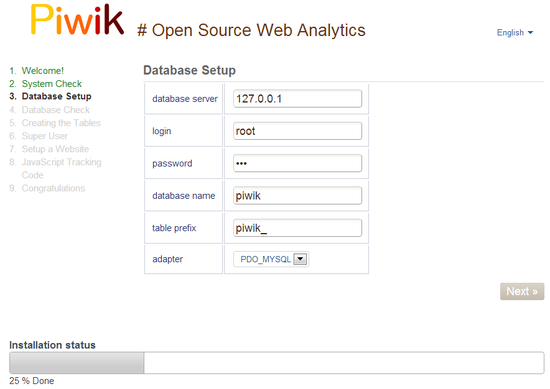 Piwik is an open-source analytics system, which can be hosted at your cloud sever. It provides a more personalized solution than Google Analytics as it lets you have ownership and more control of your data, shows detailed traffic in real-time, and it has more stylistic graphs to see your data more effectively. First, update Ubuntu for the latest software versions. APT will inform you about the available upgrade's number and size. Just type "Y" and press ENTER. During the Package Configuration, APT will ask you "What would you like to do about menu.lst?" Just press ENTER to choose the default option, "keep the local version currently installed." After a few seconds, it will ask you the same question. Press ENTER again. Use the down arrow key to go to the option, LAMP server, and select it by pressing the Space key. Press the TAB key to choose the OK button and hit ENTER. Tasksel installs the needed packages. During the installation process, taskel is asking for a new password for the MYSQL root. Type the password of your choosing and press ENTER. At the next screen, type the same password once more and press ENTER. After this, install some additional software that will be needed later on. Type "Y" and press Enter to continue. Go to the default root directory of Apache. Download latest Piwik zip file. Clean up the unneeded files. The rest of the process will go through the Web installer. At the System Check Screen, everything should be with green checkmarks. Click Next if you see this. If not, confim if you are using Ubuntu 12.04 and ran all the software updates/upgrades. At the Database Setup screen, set the database server to be "127.0.01". You can use the phrase, "root", as the login and the same password that you setup during tasksel's MySQL installation procedure. Set a name for your database, eg. "piwik", and click Next. Next screen should show: "Tables created with sucess!". Just click Next. 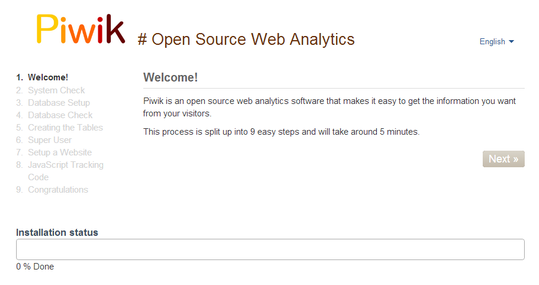 At the Super User screen, set the user login and password for logging into Piwik Analytics. Then, write your email address and your email preferences. Click Next when finished. When you enter into Setup a Website screen, set the website's name and URL of the website where you will want to install the Piwik tracking code later. You may also configure the website's timezone, and set if it's an ecommerce site or not. 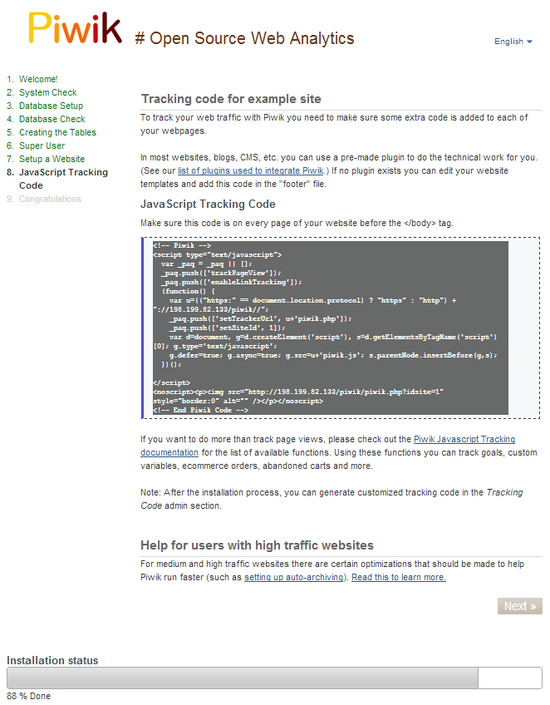 The next screen gives you the Tracking code which should be copied and pasted just before the closing tag (</body>) of your website. 1. Either copy and paste the code from this screen at your HTML templates files. 2. Follow the instructions that the piwik modules/extensions for these CMSes provide. Congratulations! Your Piwik is now installed to your cloud server. Now, to confirm if your Piwik is fully setup and accessible, enter the URL below at your web browser's address bar. 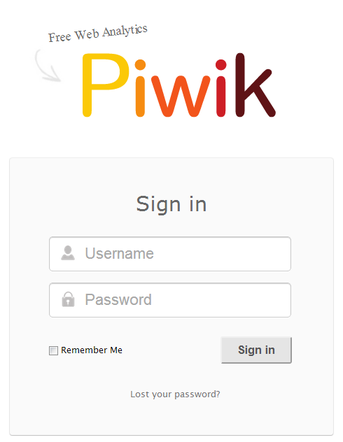 Then login using your piwik admin login user and password. Posted by: ASPHostServer Administrator - Sat, Jan 4, 2014 at 5:31 AM This article has been viewed 1781 times.